These Almond Butter Freezer Fudge Hearts are fast and easy to make and completely irresistible – perfect for Valentine’s Day or any time! 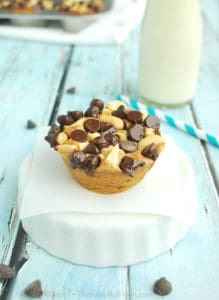 Recipes for regular and chocolate flavors are honey sweetened, peanut-free, and have a vegan/dairy free option. This time last year I was rolling out sugar cookies and mixing up batches of my all natural pink and purple sprinkles for the Valentine’s party at my daughter’s school. But this year, the GAPS diet has narrowed our options for Valentine’s treats. I racked my brain trying to think of a “real” dessert I could make for my precious kids who’ve patiently endured a month of the gluten free, grain free, peanut free, fruit free, and mostly dairy free GAPS intro diet. Finally, it occurred to me – freezer fudge! I used to whip up little chocolate-peanut butter freezer fudge balls for a simple weeknight treat from time to time, so why not make a GAPS-friendly almond butter fudge version now? But they had to be good – like, really good. The kids have gone without sweets for four long weeks (that’s a long time in our dessert-loving house! ), and I’ve been holding them off until Valentine’s weekend when I’ve promised to make a homemade dessert they’ll love. I knew whatever it was needed to be worth the wait for them (and for me!). And these are definitely worth the wait! I’ve been making and testing batches for a couple of weeks now (shhhh), and these little sweethearts are the best freezer fudge I’ve ever had! These almond butter freezer fudge hearts are irresistible, and I love that they’re healthy enough to eat for breakfast (oh yes, I have). I can’t decide which I like better – the salted honey almond ones or the chocolate almond ones. But no need to choose one when you can have two…or four. ? Both recipes are super fast and easy – just toss everything into a bowl and whisk. I went the Valentine’s route and ordered these adorable heart shaped silicone molds on Amazon. It took me some time to get the hang of filling them (see Notes section in either recipe for my method), but I didn’t mind spending a little extra time to have the finished product in the shape of bite sized hearts! If you’re in a rush, just spread the batter into a baking dish, freeze, then slice into squares (a double batch of either flavor works well in an 8 inch square pan) . These Almond Butter Freezer Fudge Hearts are fast and easy to make and completely irresistible – honey sweetened, peanut-free, and have a vegan/dairy free option. Whisk all ingredients in a mixing bowl, then fill one tray of 15 small, heart-shaped candy molds with the mixture (Click here to buy the same heart shaped silicone molds I used). See Notes section for the method I use for filling). Freeze the mold tray for about 30 minutes or until the fudge is firm and can easily be popped out of the mold. Serve immediately. Dip the butter knife into the batter, then lower the tip down into one of the hearts in the mold, sliding it upward against the side so the batter remained down inside the heart. Repeat this 2-3 times for each heart, then clean both sides of the knife on the side of the mixing bowl. Run the back of the cleaned knife swiftly across the filled heart to level off the top surface. Sounds complicated, but once you do a couple, it starts to go pretty quickly. Here are a few other Healthy Valentine’s Recipes!